If scientists could develop a chicken with 4 wings, only half of the number of chickens would have to die for the same amount of chicken wings for Super Bowl Sunday. And you’d only use half the feed. See? I come up with solutions once in a while. Reminds me of a relative who stalked proudly into the butcher’s shop one day and asked for 8 chicken legs “… and make sure they’re all back ones.” Talk about pride before a fall. That’s hilarious! I read my post and yours to my wife. Her response? “You guys are sick” (as she shook her head). What!? If you don’t mind, I think the next time I have to go to the deli, I’m going to ask the clerk if their chicken legs are all hind legs. Then I’m going to count how many seconds it takes for that to sink in. I think the next time I have to go to the deli, I’m going to ask the clerk if their chicken legs are all hind legs. Then I’m going to count how many seconds it takes for that to sink in. Keep a straight face whatever you do! Find them in the freezer aisles for $5.29 per pint. I wonder if there’s still any alcohol left in them? At $10.58 for what I usually eat at a time (sometimes twice in a row ), that would be pretty expensive ice cream for me. Has this ever happened to you? As I went to come back inside, I opened the storm door, then the inside door. As I was closing the storm door I apparently didn’t get my foot in fast enough… BANG! Then as I tried to shut the inside door quietly so as to not wake my wife up - it was 4:00 AM - again… BANG! I caught the edge of my boot with the door. I thought, “Oh come on now!” Then I heard, “Go to bed! I’m waking you up in 3-1/2 hours!” I guess I woke my sleeping beauty up! (And she went to bed a little over 6 hours ago. Oh well… Guess I better get to bed or she’ll be pouring water on my face in a couple of hours. Oops! She just announced she’s getting me up at 7! Good night! “While the ice creams are infused with liquor, each one has an ABV of less than half a percent”…not much! 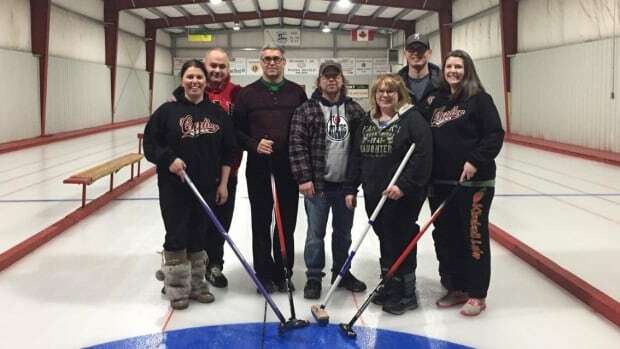 Hits from Pat Benatar will soon be blasting over the speakers at an 80s-themed curling bonspiel in Makwa, Sask., population 84. @EmeraldEyes, we need to know what happened! I think he might have thought I was bit senile and he was trying to be discreet to spare my embarrassment Or he could have just been getting his own back. Anyway, I just burst out laughing and said “you got me there”! Or he could have just been getting his own back. I do believe he was spot on and realized what you were trying to do and had a quick come back. Good one on his part! Was that with or without a pun intended? Now I can’t wait to get to the supermarket myself! By the way, I told my wife what you did and what happened. She looked up from the game she was playing (Candy Crush) and had the biggest grin on her face. Pulling his back leg or front leg? Yeah! I finally got to ask a kid behind the deli counter about chicken legs! There were about 4 customers waiting in line while two employees were waiting on us. One employee - an older gentleman - was slicing some meat for a customer. The other - a young kid - had the misfortune to wait on me. I asked him if the chicken legs were fresh, to which he responded, “Yes they are. I just put them out 10 minutes ago.” That’s when I asked, “Are they all hind legs or mixed?” The older man behind the counter just cracked a smile out of the corner of his mouth. (He must have a sick sense of humor also. ) The young kid stood there… not knowing what to say… or didn’t realize what I had asked. After almost 10 seconds he looked at me with a very sincere look on his face and said, “As far as I know they’re all hind legs. I’m not sure what we do with the front…” And he stopped himself and started laughing! So did everyone else! Then the poor kid’s face got so red! He almost looked relieved when I told him I really didn’t want any chicken legs, but I just thought I’d ask about them. With that I turned away… smiling at the other customers who were still chuckling. I guess everyone turned out in a better mood because then they actually started talking to one another whereas before this stint they just stood there looking around in silence. So that paid off rather well. Next time, ask if they have wings. Then, ask if they are corn-fed wings or oat-fed wings, because you heard oat-fed wings are meatier than corn-fed ones. Newfoundland thieves have made off with some unusual loot: iceberg water.